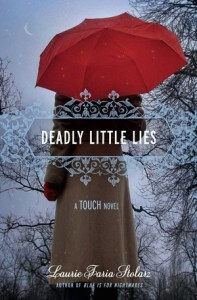 Laurie Faria Stolarz’s Deadly Little Lies intrigued me with its mysterious characters and exciting story. Last summer, sixteen year old Camilia had been getting a numerous amount of notes from a ‘stalker’. There were pictures of her, phone calls and nasty messages. After toying with Camilia’s fears, the stalker kidnapped her and tried to keep her captive. The only reason she escaped was thanks to Ben. He knew she was in danger because he had a unique talent, called psychometry, a gift where he senses things through touch. After rescuing Camilia, he left town, and not for the first time. After months passed, Ben comes back but Camilia soon finds out that even though he is back home and back in school, he does not want anything to do with her. Meanwhile, Adam, the new employee at Knead, the pottery shop, is too good to be true. He is a kind, caring, handsome boy who likes her. Since Ben is reluctant to be part of her life again, she soon starts dating Adam. In the meantime, many more threats resume to come. Could it be too coincidental that the threats come back at the same time Ben returns? The school counselor thinks they are just a prank but Camilia thinks they’re real. She believes this because lately, she has found that her pottery talents have been producing more than just works of art. She’s been sculpting premonitions, somehow developing psychometric powers of her own. Will they be strong enough to save her? Laurie Faria Stolarz is a master creator of suspense and romance. 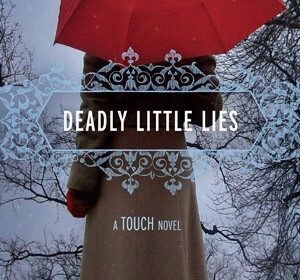 I loved the book Deadly Little Lies and can’t wait to read the next one. The cliff hangers and mystery that the novel shows when Camilia is being stalked makes me love this book even more. This book is filled with anticipation, romance and a very exciting storyline. The characters in Deadly Little Lies is probably what I like most about it. They are mysterious, surprising, and brave people. The ending of this page turner is really unexpected and I definitely recommend this novel to everyone!